Bye, Bye New York! Hello Hong Kong! It has been about a month and a half since I wrote my last post, and you wouldn't believe how things have changed for my little family and me. Let me explain. By the end of July, I resigned from Heights Chateau and therefore left my position as Store Manager, Wine Buyer and in-house Sommelier. The first week of August, realizing an old teenage dream, I rented a car and embarked my family in a journey across the United States following the Old Route 66 from New York to Las Vegas. 7 days later and a lot of driving and sightseeing mainly from the car, we safely arrived to Las Vegas. It was a nice farewell to New York after nine years living in the Big Apple. We then set our sails toward new horizons. In fact we didn’t sail away, but we took a plane and flew on the other side of the planet, yes, in Asia. We landed in Hong Kong about 3 weeks ago as visitors, and after…, well, who knows what the future holds! So, for those of you who wondered where I went, that’s what it is, Hong Kong! The new financial hub of the world. The place where all China wants to be, and the rest of the world with it. After the city in London and Wall Street in New York, here rises the IFC building, icon of the Hong Kong financial district and market. Hong Kong is another world, a world on his own with its own rules and ways. It is a booming island with a lot happening and where everyone from Mainland China, Asia, Europe and the Americas meet, share and collide in many ways. Hong Kong is made by the people and for the people, more especially pedestrian. No town or city is really perfect, yet when it comes to public transport (bus, taxi, ferry, metro, tram, etc..), Hong Kong is surely in the top 5 of the best city in the world. Taxis are rather cheap compared to Paris, London and New York. A fare from Central to Wan Chai correspond to about HK$30, which is about US$4 (with no traffic, a bit more if traffic), just ask the driver not to take the harbor road, because it is a mess at the moment as they are completely revamping and enhancing the water front and piers. Hong Kong underground train or subway or tube (locally called metro MTR) is the fastest and safest I ever took in my entire life. In Paris, only the line 1 and 14 can compare. In London, the tube is pretty good I must say, but Hong Kong is way better with bigger continuous wagon and safety measures that exceeded my expectations as a regular passenger. And above all, the Metro is immaculate compare to the other 3 city cited above. New York should be ashamed of its metro system. In Hong Kong, everything is pristine and clean, well maintained, well indicated, users friendly, well guarded with surveillance camera everywhere and ultra safe day and night. On the platform, you even have glass walls and sliding doors to protect the rails and consequently avoid stupid accidents and other mayhems. They even have electronic billboards everywhere to give you some info like let you know when the next train will arrive. In Paris, these electronic billboards on the platform existed already 15 years ago and more than 10-12 years ago in London. In New York, they’ve just started installing them last year and not in every station. It is a beginning, granted, and MTA is moving in the right direction, I hope for them and the New Yorkers, but they could have get inspired a long time ago. It is almost like if the city of New York just realized that people where living there and that it is time to do something nice for them… (by the way, they even tease you by posting some advertisement bill saying: “Wouldn’t it be nice to know when your next train will arrive?”, which is pretty bold when you think that it happened elsewhere more than a decade ago). More over, in the Hong Kong main metro line, the trains come every 3 minutes, not like on the “A” line in New York where you can wait in average 10-15 minutes (or way more if something happened) between each train. And don’t get me wrong but New York City counts about 8.3 millions people, therefore, don’t you think that they could have done something earlier than within the last 2-3 years. Sorry to say, New York is a great city in many ways, but in the mean time New York stinks in many ways too and it is not as people friendly as it seems (although it is a bit better than it was). Honk Kong island, Kowloon and the southern part of the new territories count about 7 millions people, and everything is there to help pedestrians: metro, bus, trams and taxis, in quantity and at low rate. So New York, what are you waiting for. Anyway, so here I’m in Hong Kong, and life goes on with new adventures and plenty more wines and food tasting waiting to be shared and described. New country, new people, new culture, new behaviors, a lot to take in and embrace and a lot to discover and enjoy too! Soon I will continue to write more posts, but for now, I have been a bit busy and didn’t really take the time to sit down to write (but it will come). 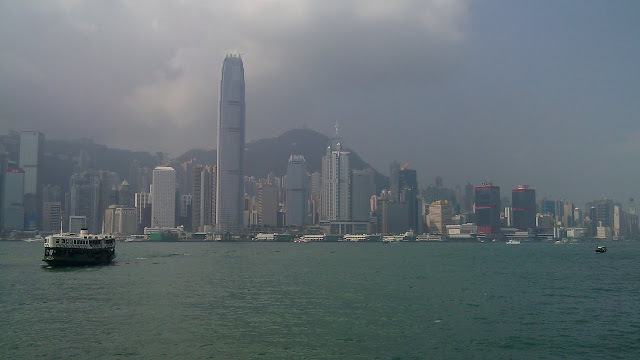 I will also share more views about Honk Kong. Among the few things that I will miss from New York, the first that come to mind are: bigger apartments, bigger side walks, people with a certain notion of space and surrounding, and the fact that when the sky is blue and the sun is shining, the sky is blue not grey and polluted like in Hong Kong. But hey, so far, we had quite a few great sunny days where we could see a bit of blue in the sky and the sun has been here too, pretty much everyday, even if it was mostly overcast. Also the temperatures are slightly going down and it feels much better to be outside than a few weeks ago, yet it is steel very humid and hot and sweaty, but after-all it is a subtropical climate on an island. LeDom du Vin now from Hong Kong.